Tech 1 Frigates are one of the first ships that a new player learns to fly, and their value combined with their low skill requirements make them an excellent choice for someone embarking on a career in PVP. In fact the pure enjoyment and versatility provided by these ships leads many PVPers to fly them as their solo PVP vessel of choice long after they're capable of flying larger or more expensive ships. Attack Frigates trade survivability for speed, and excel at dictating the terms of a fight. The Attack Frigates are designed for speed and tackling capability. All ships in this class receive a bonus significantly reducing the capacitor need of tackle modules. Combined with their high speed and strong capacitor regeneration, this makes the Attack Frigates an excellent choice for both long range and close range tackle. Attack Frigates are significantly more fragile than the beefier Combat Frigates, however their damage outputs remain similar to their more resilient cousins leaving them very effective if they're able to dictate the terms of an engagement and avoid taking damage themselves. Combined with their high speed (allowing them excellent range dictation) the Attack Frigates can make very effective solo vessels, and flown correctly they can be every bit as dangerous as their Combat counterparts. The Slasher is a fast ship, able to push 1.4km/s with an Afterburner or 3.7km/s with a MWD without any additional speed mods. A 4/4/2 slot layout lends it plenty of versatility either as a tackler or as a flexible kiter/brawler. In addition to the class-wide bonus reducing cap use for tackle modules, the Slasher receives bonuses to projectile damage and tracking speed. With three turrets, this makes it very close to the Rifter in terms of offensive capability. The fourth mid slot is really what makes this ship as effective as it is. This lets the Slasher shield tank (preserving its natural speed) while still fitting the holy trinity of PVP - propulsion module, Scram and Web. Alternatively the Slasher can be flown with just a Scram or long point, and use its additional mid slot for electronic warfare such as a Tracking Disruptor, or for dual propulsion. With its slot layout, it's no surprise that the Slasher is generally shield tanked. This is usually in the form of either a buffer tank using a single Medium Shield Extender, or an active tank using a Medium ASB. The buffer tanked Slasher is still on the fragile side compared to the Combat Frigates, coming in at around 5k EHP with a typical fit. A MASB variant offers a meagre 2k EHP leaving this ship in significant danger of simply being volleyed, however this is compensated for by an active tank of around 90dps - not a huge amount, but enough if the Slasher is also able to mitigate some damage through other means. The speed of the Slasher is its main method of doing so - with an Afterburner and Web its ability to dictate range is exceptional, and it's fairly easy for a Slasher to hold you at range or getting under your guns as desired. Sometimes you'll see Slashers mounting an armour tank, allowing them to fit both a Web and a TD for maximum control of an engagement. While this makes the Slasher very fragile, such a setup can be incredibly dangerous against other turret ships if you're not able to hit it effectively. The Slasher is generally an autocannon boat. With one fewer low slot for damage mods than the Rifter and no launcher hardpoint, the Slasher can't squeeze out quite as much damage as its Combat cousin although it remains close - around 100-120dps on a typical fit, although a dps-oriented one may do a little more. The damage projection on its ACs is fairly decent, complementing the Slasher's already strong range dictation abilities - around 0.7+5.5km with close range ammo, or 1.4+8.3km with Barrage. While the Slasher can hit for reasonable damage out near the edge of web range, it will be deep in falloff and realistically putting out far less there than in its ideal damage output at that range. As a result, a Slasher will generally put out significantly less damage while kiting than it will when brawling. Some Slasher fits feature artillery for higher damage out at range in exchange for losing the brawling option, however the Slasher's mid-heavy slot layout isn't really conducive to a long ranged kiter and you'll probably find most of them operate in or close to web range even when arty fit. As with all Attack Frigates, you'll often encounter the Slasher in a pure tackling role as part of a gang. The fit for such a ship is likely to be very similar to an MWD fit buffer Slasher, except using a long point and probably not coming anywhere close to web range. This is a fairly agile ship so you may find it difficult to throw off or catch, and the ease with which it can be shield tanked means you're less likely to encounter an untanked one than you are the other tackle frigs. Fighting a Slasher is like a more extreme version of fighting a Rifter - they're likely to use their range dictation to either kite you if you're shorter ranged, or brawl in close if they can get under your guns. Be prepared for a Tracking Disruptor, which will exacerbate this effect although unless it goes without tank, this will likely mean it doesn't have a Web. It's not a particularly tough ship, so you don't have to be in range for long - overheat your Afterburner early if you have one, and try to force the fight into your ideal range (you might not be able to hold it there for long, but you don't need to). If you're unable to prevent the Slasher from dictating the course of the engagement, you're likely to find yourself fighting at a disadvantage and possibly unable to hit it at all. EM or thermal damage will help you out considerably, hitting the Slasher's resist holes and reducing the amount of time you need to be in range for to take it down. Strap a bunch of Light Neutron Blasters to a 1MN Afterburner, and you get an Atron. This little ship flies fast and packs a great punch, without being distracted by unnecessary things like tank. A balanced 4/3/3 slot layout leaves the Atron well rounded, able to fit propulsion, Scram, and Web, while saving its low slots to enhance its damage, range or speed. The Atron is usually fit as a blaster ship - a role it fills very well. Its three turrets receive bonuses to hybrid damage and falloff, making the Atron both powerful and flexible, able to deal with kiters (or to kite itself) more easily than most other blaster ships of its size. A typical blaster Atron can put out anything up to 200dps, at ranges of around 1.6+6.1km with Navy Antimatter (with the Atron's falloff bonus it doesn't really make sense to use Void) or an impressive 3.6+8.5km with Null, roughly comparable to small autocannons with Barrage. When fit specifically for range, that can easily go higher. While the Atron doesn't receive a tracking bonus, the tracking on blasters is already strong and you're unlikely to reduce its damage much by orbiting in close. It's quite difficult to effectively tank the Atron without cutting its range and damage output significantly, and most people simply don't bother to go further than a Damage Control. Thanks to the naturally high Gallente structure HP, that alone should give the Atron a buffer of around 2.6k EHP - fragile, but more than its peers would have if they were fit in the same way. The Atron's real 'tank' comes instead from its speed and damage output - with an Afterburner this ship pushes a healthy 1.4km/s (or around 3.7km/s with a MWD), allowing it to close quickly and get under enemy guns or pull range if its taking too much fire. Failing all else, it can simply hope that its powerful damage output fill finish the job before the job finishes it! The Atron's fourth high slot allows it to potentially fit a Nos, however this is often eschewed in favour of bigger blasters. Atrons (like all Attack Frigates) already have strong base capacitor, and if carrying a Nos you can expect them to be quite resistant to neuting. Rail Atrons are not unusual, but are in the minority. These typically fight inside web range, using the Atron's high speed along with a Scram and Web to hold opponents at a comfortable distance while 125mm Railguns let the Atron project its own damage to that range with ease. A rail Atron can hit out to 7.8+12km with Navy Antimatter on a typical fit, for a very competitive 130dps. Tackle Atrons are also fairly common, generally fit with a MWD and long point and otherwise very similar to your standard tackler to take advantage of the tackle module cap bonus which they share with the rest of the Attack Frigate class. They may or may not be tanked (usually using a shield buffer if they are), but will likely be difficult to catch. Fighting an Atron isn't quite like fighting a regular blaster ship since they can project damage relatively easily. Rather than trying to pull range and avoid its damage, your priority should instead be applying your own damage output to capitalise on its weak tank. Providing you're able to hit effectively, an Atron usually won't last very long. If you're flying a particularly fragile ship yourself, do what you can to make sure you're applying your own damage output more quickly and effectively than they are - overheat immediately, and pray! The damage type you use is fairly unimportant since the Atron's main tank is in structure, and the Atron itself will hit your shields and armour with roughly the same effectiveness. 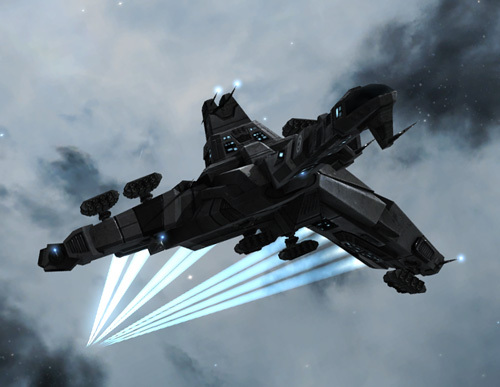 The Condor has great damage projection, able to wield either rockets or light missiles with comparable effectiveness. This ship receives a double bonus to kinetic missile damage in addition to the class-wide bonus to tackle module cap use, giving the Condor quite robust damage for a missile ship. A 4/4/2 slot layout means plenty of mid slots for range control and electronic warfare, synergising nicely with the Condor's other strengths. 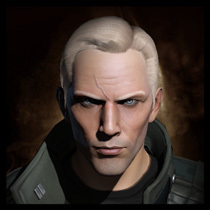 The Condor's raw damage output is among the lowest for any combat-oriented frig. A light missile Condor put out something in the region of 90dps under ideal circumstances, albeit with excellent damage projection out to around 40km. The rocket variant is a little more impressive, offering anything between 80 and 130dps depending on ammo selection and the number of damage mods it's carrying. While rockets can only project damage out to around 10km (or 15km with javelin), the fact that they operate inside web range means that the rocket Condor will usually put out damage far more consistently than its long ranged counterpart. Since the Condor's bonus is only to kinetic damage, its damage output drops off substantially when loading any other flavour of missile. Because of that, most Condors will stick to kinetic missiles outside of exceptional circumstances. The Condor has the lowest base speed of the four Attack Frigates, but that doesn't make it slow by any stretch of the imagination. Light missile Condors are generally fit for mobility, with typical top speeds of around 4km/s. Even an afterburning rocket Condor can move at something like 1.3km/s, giving it a significant head start in range dictation against most other ships outside its class. The Condor's four mid slots make it an excellent ship for controlling a fight, as well as a proficient shield tanker. A rocket Condor will usually feature the holy trinity of afterburner, scram and web alongside a single slot shield tank. A Medium Shield Extender gives the ship a light buffer tank of around 4 or 5k EHP, while alternatively a Medium ASB provides it with a relatively strong active tank for a short duration. In this configuration the Condor is generally able to dictate range against most other frigates, while the web proves invaluable for increasing its damage output against afterburning targets. Some variations may drop the web for a second ASB or a tracking disruptor, sacrificing range control for extra tank or damage prevention against the targets that it's still able to kite effectively. A more unusual choice again is to drop the shield tank completely in exchange for either a light armour tank or no tank at all. This allows the Condor to fit either dual webs or a web and TD, allowing it exceptional control over the fight at the cost of a swift death if it can't evade an opponent's fire. The light missile Condor - easily the more common of the two in the current climate - is slightly more exotic. While some variants will still fit a small ASB, most light missile Condors fit no tank whatsoever, relying entirely on speed and electronic warfare to survive. The most common setups feature a long point and either dual tracking disruptors or dual damps, allowing the Condor to completely prevent any firepower from reaching its orbit. For context, dual damps will put a Thrasher's lock range down to around 12km, while a pulse Coercer with two TDs on it won't hit out further than 6km with Scorch. In both situations, success for the Condor pilot relies on picking their targets carefully - damps will only be effective if the target's base lock range is around 40km or less (which generally means sub-cruiser), while TDs leave it vulnerable to drone and missile damage. Unless you can hit it effectively on its chosen orbit, the best way to deal with a light missile Condor is to slingshot it - quickly reversing your direction to either throw it into scram range, or outside of its own point range so you can escape. Landing a scram on a damp Condor can be particularly difficult, since you can't start locking it until you get inside your already damped-down lock range. The lack of tank on this ship means that you don't usually need to be in range for long - once you can actually hit it, it should go down fairly easily. Without a web the light missile Condor can struggle to apply damage against afterburning targets, so keeping your speed high will give you more time to escape or land a scram. Some active tanked ships might find themselves able to tank a Condor indefinitely so long as you can keep moving. While a typical light missile Condor is fairly engageable with some smart piloting, this is one of those ships that synergizes incredibly well with skirmish links - not only does it make it faster and harder to catch, but the extended point range allows the linked Condor to orbit wider, making slingshotting incredibly difficult. Beware of engaging Condors if you suspect that they have a link alt. Rocket Condors are a different game - they'll generally try to keep you webbed and scrammed, and then either orbit close if your tracking is poor or far out near the edge of scram range to reduce your effective damage output. Your job, obviously, is to prevent that. Overheat your afterburner if you have one, and either burn away in a straight line if they're trying to get close, or towards them if they're trying to stay far away. If you're in a turret ship then the lower angular velocity you can have against your target, the better. The overall gank and tank ability of the Condor is fairly low, so providing you can hit them effectively you should have the advantage. The Executioner follows a similar pattern to the Atron - a 4/3/3 slot layout with strong damage output and a tendency not to fit very much tank. 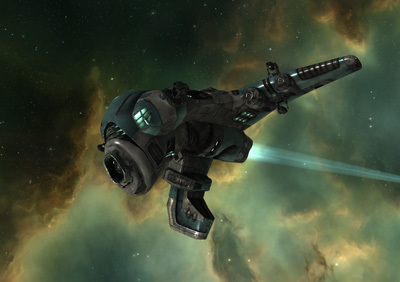 Like most aggressive Amarr turret ships, the Executioner receives bonuses to turret cap use and damage in addition to the usual bonus to the cap requirement of tackle modules. There are two common ways to fit an Executioner. The most standard of these is to fit Afterburner, Scram, and Web, and fight as a flexible kiter/brawler much like the Atron. The Executioner performs very well in this role, with comparable speed to the Atron (1.3km/s with AB) while putting out anything up to 180dps with Navy Multifrequency crystals at 3.8+2.5km, or around 140dps with Scorch at 11+2.5km. With Scorch, the Executioner really shines - since it still has the high tracking of close range guns it'll hit far more consistently than a rail or arty ship, and given that its range is almost entirely optimal it still puts out its full 'on paper' damage output at the edge of web range, unlike blasters and autocannons which will find their real damage output significantly reduced. The fact that the Executioner can instantly switch between kiter and brawler lends it a surprisingly great deal of flexibility, although it generally remains very fragile. Some variants of this setup solve that by swapping the Web for a Medium Shield Extender, more than doubling its buffer but detracting from its ability to dictate range. The second school of fitting is to kite outside of web range, using Tracking Enhancers and Energy Locus rigs to enhance the range of the Executioner's pulse lasers in mimicry of the Imperial Navy Slicer. While the Executioner doesn't perform anywhere close to its faction counterpart in this role, it can still make a fairly handy setup - around 16+4.1km with Scorch and 125dps is quite easy to achieve, while the ship pushes around 3.7km/s under MWD with a single speed mod. Particularly convenient here is the combination of strong base capacitor and the class-wide bonus to tackle modules, allowing the 'baby slicer' Executioner to be completely cap stable - something which the actual Slicer is not. However the fact that it has to operate really quite close to web range in order to hit effectively leaves the Executioner at quite a high risk of getting tackled, and unlike ships with true long ranged weapon systems it can't just solve the problem by using longer ranged ammo. Both varieties of Executioner are often very lightly tanked - a solitary Damage Control is not uncommon, giving this ship around 2.4k EHP (a little less than the Atron). Some Slicer-style Executioners may not even fit that, opting for pure speed and damage instead. Variants with a Medium Shield Extender are a little tougher, coming in at around 5.5k EHP. Executioners are very effective as tacklers, being quite easy to fit without powergrid mods and thus leaving plenty of low slots free to enhance its speed. While it may not be the fastest Attack Frigate by default, a tackle Executioner with two speed mods can push a very impressive 4.4km/s, making it in effect the fastest Attack Frig. It's fairly easy to get a Medium Shield Extender onto a tackle setup, however despite this it remains very common to see them almost or completely untanked. At the risk of sounding like a broken record, the key thing to remember when fighting an Executioner is to make sure you can apply your own damage effectively - it's usually quite fragile, and will break relatively easily if pushed. Don't go chasing after a ship that you can't catch - in the case of the baby Slicer variant get them to chase after you, and then double back to get a scram/web on rather than trying to burn for them initially - this is a fast ship, and catching them via conventional means won't be easy. If you're able to get in close, you may well mitigate some damage just by getting as close as possible and taking advantage of the relatively poor tracking on Medium Pulse Lasers, although if you're well tanked yourself them this shouldn't be necessary. This is particularly true if you're up against a MSE variant, or any other setup without a Web. The EM and thermal damage of the Executioner leaves it slightly weak against armour tanks, however it's very proficient against shield tankers like the Slasher and Condor so be wary of your EM resist when taking one on. You alluded to it - but both the condor and slasher in their AB versions can perma run a small neut - which can be an additional tool against something small that gets in too close, or something bigger whose guns you are under. Even with all 5 skills, the Slasher cannot permarun a small neut. You don't really 'skill out' of these ships any more - they're now on the same tier as frigs like the Rifter and Merlin, and many solo PVPers keep returning to those ships even after they've been playing for years. Sure they'll fly their bling too, but the nice thing about the balancing is that these ships don't really become obsolete any more. A well flown Slasher can take down a Dram, and the Condor actually outperforms the Crow in many ways. Agreed, this article (and the previous one about combat frigs) are awesome. So much of the PvP discourse is about BCs and other expensive ships, so the focus on frigs is welcome. To the OP, thanks for your insight, as an anonymous who's done so much and helped so many, I value your opinion greatly! Nice article, thanks for the info! I've been thinking about trying the attack frigs out for a good intro to fleet inty work. Thanks for the great guide. I'm not sure if you're aware but every second frig in rvb is now an attack frigate. They're insanely popular since the rebalance due to their ultra-low price and effectiveness. What do you think of AB-scram-tank fits on the atron/executioner? Their speed means the lack of a web is not as much of an issue as it would be on a combat frigate, and you can wedge a MASB onto the Atron at least this way. Great to hear they're so popular with you guys - a similar thing seems to be true elsewhere too. I knew you could get an MSE onto the Executioner, I'd never seen it done to the Atron but it makes sense (and it turns out it's surprisingly easy). In frig gangs, it's definitely the best way to go - you don't really need the webs there for range dictation since if you're not tackled and your target is, you should have it anyway. I think the armor slasher is underrated. You're not giving up much speed, and you can legitimately speed tank anything that doesn't have multiple drones or a tracking bonus by fitting a TD (even while webbed). But then, I have an unhealthy fixation on sig radius. I've been flying Executioners a lot lately (my first "real" ship in EVE and still my favourite hull) and am loving them so far! Mostly the AB version though, lost too many of those MWD ones :P (Need to get my RL skills up for that I fear.) And ye, there's a lot of those attack frigs being used in RvB, especially for the solo work in Nomaa!